Slots of Money is an unusual slot game which offers a 3-4-3-4-3 reel format. Wins are not determined by paylines, but 4 or more symbols appearing adjacent to each other. This game has casino-theme to it, with diamonds, jewels and the Vegas sign all making an appearance in this Betdigital slot. The bonus feature in Slots of Money includes free spins with added multipliers, bringing lots of chances to win. The Theoretical RTP (return to player) on this slot is 94.58-95.50% and this slot is low to medium volatility. 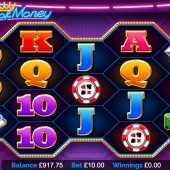 If you like this sort of game then you should also check out some of the reactor-style slots like Play'n Go's Gemix and Reactoonz, both of these slots are available online in both free play and real money. I personally prefer the good old fashioned 5 reel format, but that's just me.